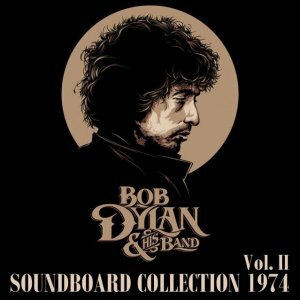 Bob Dylan had largely been off the road since 1966, but upon the release of Planet Waves, in January of '74, he and the Band reunited for a full-scale tour to promote the album and to roll tape on a forthcoming live release. Naturally, expectations were high for Dylan and the Band across the board and rightfully so - it had been awhile since they'd first made their mark together on tours in '65 and '66, recording what would come to be known as The Basement Tapes in Dylan's Woodstock outpost. Though, in the breach, the Band had grown artistically and could now claim an identity independent of their relationship to Dylan. All told, this was primetime for all involved, and after 40 concerts in 43 days, the tour culminated with three shows at the Forum in Inglewood, California (which is where the bulk of the tour's ultimate live document, Before the Flood, was recorded). Along the trail The 1974 Tour blazed, it's safe to say that at any given show these guys were capable of igniting some real fires; they even changed the set list nightly to ensure they stayed charged up. But on a night like this at Boston Garden, while the running order is positively inspired, Dylan and the Band are also four-alarm blazing, and the elements combust into a demonstration of why, when it comes to epic American roots rock, Dylan and the Band are like a fire-breathing, rock 'n' roll hydra and unbeatable combination. The show kicks off with a barrelhouse version of "Rainy Day Women #12 & 35" which sets the tone for what's about to unfold: The mood is irreverent and loose, yet between the cracks you can tell this is going to be a night of stone-serious music. Dylan himself is in rare form - full voiced and strong, maybe even atypically confident and powerful - soaring over the Band who needless to say is in the pocket. Robbie Robertson's guitar sears on "Lay Lady Lay" as much as it soothes on "Just Like Tom Thumb's Blues." Garth Hudson and Richard Manuel keep pace with Mr. Jones on "Ballad of a Thin Man," while Levon Helm supplies his steady hand throughout the set. Lest we forget Rick Danko, mid-set, the spotlight turns toward him as the Band gets to turn out their own brace of songs, trading vocals and licks; Danko's pleading "Stage Fright" and desperate "This Wheel's on Fire" provide their set with its heart, while Helm's readings of "The Night They Drove Old Dixie Down" and "Cripple Creek" give it its crunch of Memphis soul. Finally, Manuel's interpretation of Dylan's "I Shall Be Released," gives the proceedings a touch of gorgeous. Concise and compelling stuff, as Dylan returns to the stage to finish off the night, the unbroken circle of magic is complete as the assembled musicians pour into "All Along the Watchtower" with a vengeance, and give it all they've got to a super-twangy "Hollis Brown." Segueing from there into his acoustic segment, Dylan draws largely from his folky repertoire that established his reputation rather than the relatively more recent material from Planet Waves or New Morning he cut during his touring hiatus. In performance you can hear the beginnings of his practice of shapeshifting his own music, adapting the older material and investing it with new meaning. Timeless acoustic offerings like "The Times They Are A' Changin'" and "Don't Think Twice It's Alright" merge with the sensitivity of "Just Like a Woman," the potent poetics of "Gates of Eden," and a stupefying "It's Alright Ma (I'm Only Bleeding)," to become astonishingly compatible with the contemporary electric edge of the rest of the set. Unfortunately, this is where the tape ran out during the recording of this performance, and so the subsequent solo Band and final Dylan/Band mini-sets are missing here. In Bob Dylan Performing Artist, Crawdaddy! founder Paul Williams wrote of the '74 tour, "The performances that resulted are not among the best of his career; but they are frequently very moving and represent a crucial transition: Dylan's reclaiming of the stage as a performing artist." True enough, for whatever the shows lacked in subtlety and nuance, they more than made up for with passion. Dylan and the Band sound most at home in performance; like ducks to water, they belong onstage, and back on the deck, it's as if the intervening eight years away from each other and the big stage never happened. And while the consensus among so-called Dylan experts may be that this era was not his finest hour, in terms of pure, authentic rock'n'roll rendered without smoke, mirrors or effects, Dylan and the band come as close to perfect here as imperfection gets. It's safe to say the crowd in attendance was satisfied, based on the sustained reverence of their cheers at the recording's end: they've witnessed greatness and they seem to know it. Prepare to be knocked out. 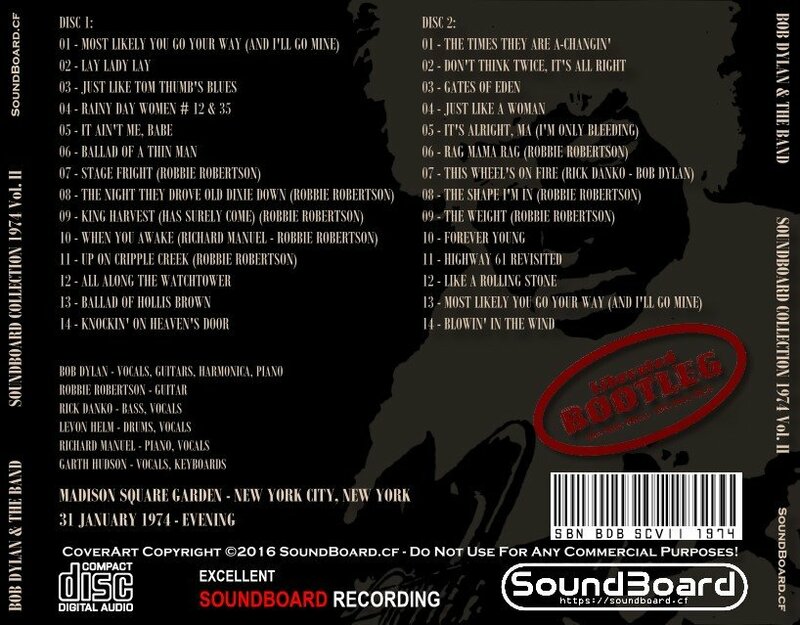 Soundboard Collection 1974 Volume II 0 out of 5 based on 0 ratings. 0 user reviews.